Welcome to the 15th edition of our featured series, titled “Ask the Produce Expert.” In this series, we feature an expert in the agriculture world and ask them industry-related questions. If you have a question that you want answered by an industry expert – it’s as easy as tweeting us or posting your question on The Produce Mom Facebook page! The Produce Mom Family of Partners is here to answer your questions! In this edition of Ask the Produce Expert, Julie Cates of Linwood Elementary is our featured expert. Julie was recognized as Outstanding Educator of the Year by California Ag in the Classroom for utilization of The Produce Mom’s #ProduceChallenge™ & Find Your Favorite® program to teach academic standards. 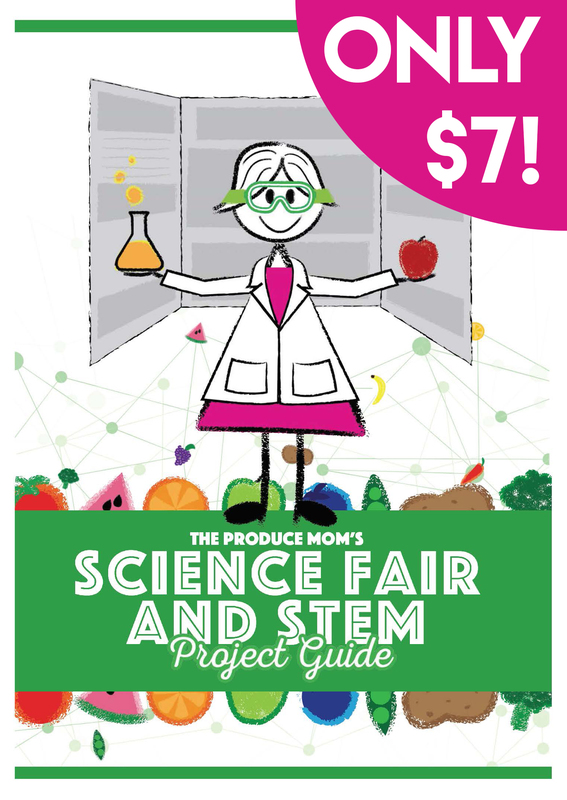 Julie worked with The Produce Mom to create a curriculum to promote fresh produce to help satisfy educational standards. Since August 2015, Julie Cates’ sixth grade class from Visalia, California has been incorporating The Produce Mom Produce Challenge™ calendar and sampling different produce items on Fridays, collecting data about the experience and sharing the findings on social media with the hashtag #FindYourFavoriteFridays. The students have full control of analyzing the sampling data. The #FindYourFavoriteFridays samplings were a huge success that the program has expanded to #TryItTuesdays. Julie’s incorporation of the fresh produce happens throughout the week to correlate with The Produce Mom’s Produce Challenge calendar. Academic standards from both Common Core & Next Generation Science Standards are fulfilled and cited during Cates’ activation of #FindYourFavoriteFridays and #TryItTuesdays. Recently, Julie’s classroom helped produce The May and June #ProduceChallenge calendar – the students spear-headed the selection of the daily challenge items. Julie is here today to share her story and how she was able to incorporate fresh produce into her classroom curriculum… Let’s get to the questions! The Linwood Elementary 6th grade students gave a unanimous “thumbs up” to the official vegetable of California! Welcome Julie! Why do you feel it is important to incorporate fruits and vegetables into your classroom curriculum? American society has moved away from the farm to fork connection. It is critical that future generations understand the importance of food, where it comes from, and stewardship of the precious land available for agriculture. #FindYourFavoriteFriday played a huge role in the taste testing of fruits and vegetables for your students; how did you decide what fruits and vegetables you wanted them to try? In the beginning of the school year I would checkout the calendar and select foods which were locally available and affordable to my families, so that when the kids requested them, the parents could access. I tried to taste a familiar food one week and a not-so-familiar food the next week. After a month or so, the students began making requests. This created classroom ownership of the program. How were you able to integrate #FindYourFavoriteFriday into other areas of your classroom curriculum? I utilize lots of curriculum from California Ag in the Classroom because it is already aligned to Common Core standards. I also look at what is on the calendar and think about how the fruit or vegetable can fit into my current content areas. For example, in September our class was learning to divide fractions. Summer squash (zucchini and crook neck) are very easy to slice. We used plastic knives and paper plates to solve fraction-division problems and then we tossed in the crock pot to make soup! Later in the fall we used sugar snap peas and pumpkins to create ratio problems using seeds to whole as our base. Why do you think that classroom tasting is critical to the overall consumption of fruits and vegetables? Children in America are not eating enough fruits and vegetables and the reason for this could be that they simply have not exposed to any sort of variety. Food is not nutritious until it is eaten. A classroom is the perfect place to expose children to a bite sized taste of new food and the positive peer pressure helps too! Did you have any initial pushback from your students when you were asking them to try new fruits and vegetables? We love to hear that #FindYourFaovriteFridays led to #TryItTuesdays; what made you expand the taste testing to a second day? The students were so enthusiastic about Fridays that they asked if we could try more than one fruit or vegetable each week. I added #TryItTuesdays to honor that request and to have Tuesday be more about new foods and try to keep #FindYourFavoriteFridays for favorites and repetition. As I stated earlier, food is not nutritious until it is eaten. What were some of the metrics that the students used after taste testing? We have gathered data on “First Try,” “Like it,” “Not My Favorite.” We have utilized this information to guide discussion and writing language arts earlier in the year, and positive trends, a topic we have recently started (statistics). After implementing the curriculum into the classroom for an entire school year, what has been the biggest change that you have noticed with your students and their attitude towards fruits and vegetables? I have noticed that students definitely are willing to try more foods, but also to talk about them, request them, and eat them off of the cafeteria plate. The latter is hugely important to me. When we tasted peaches, I had students claim this was their “first try.” Peaches are a staple in school food programs, but many students did not know what they were. If families do not purchase fruits and vegetables, the children will not eat them. Your classroom worked on putting together both the May and June Produce Challenge™ Calendar; how did your students pick and decide on what fruits and vegetables they wanted to see on the calendar? This was a family assignment. Each student had to come up with five family favorites, how they prepare the fruits and vegetables, nutritional information and a quote. This is how we came to try bitter melon! What are some other ways that you have incorporated agriculture into your classroom? We love to taste food from the cultures we have examined in Social Studies. While it is challenging to try foods from ancient cultures, we noticed that many of the cultures we studied produced food in the Mediterranean climate, which we have here in California. For example, cucumbers were grown along the Tigris and Euphrates Rivers in ancient times. Cucumbers are a class favorite. So, we found a recipe and made pickles from the cucumbers as the ancient civilization might have done. We have received farmer visits. We had an informative writing project on cotton. During the cotton farmer visit, he shared that he has grown peaches for Del Monte for 40 years. This led not only to our tasting of fresh and canned peaches, but our cost analysis of the least expensive way to put peaches in our lunches. California Ag in the Classroom sponsored a field trip-to-you experience with the Agrium Seed Survivor Mobile Classroom, and we snagged it! It was great to have the lessons that we learned exemplified by the use of technology and interactive games. We also have an amazing school garden and Garden Club teacher, and we have tasted some of her kids’ club harvest! That concludes the 15th edition of our Ask the Produce Expert series! A big thank you to Julie Cates for sharing her expertise and insight! Follow Julie on twitter to see all of her classroom work in action. The kids in Julie’s class are indeed fortunate to have a teacher that values nutrition and has found a way to make the concept of “farm to fork” come alive in her classroom. It’s wonderful that students have this opportunity to learn about and taste a wide variety of fruits and vegetables with which they may not otherwise have come in contact. It is wonderful to see that Mrs. Cates is doing amazing work with her students; not only using fruits and vegetables to teach core standards, but creating healthy habits. If we had all teachers do the same, we could probably see an increase in fruit and vegetable consumption in children, as well as a possible decrease in childhood obesity. Way to go Julie!